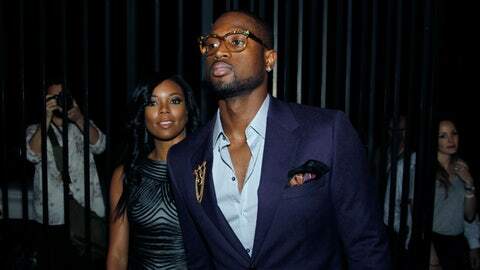 Dwyane Wade recently got engaged to his longtime girlfriend actress Gabrielle Union. The Dwyane Wade baby situation had gotten a little more starry, with Damon Wayans Jr. revealed as the father of the other two children of Wade’s new baby mama, Aja Metoyer. Wade of course got engaged to his longtime girlfriend, "Bring It On" and "Being Mary Jane" actress Gabrielle Union, shortly before Christmas — about six weeks after little Xavier Wade was born. The Wayans-Metoyer connection came to light on New Year’s Eve, courtesy of TMZ, which on Thursday also had a comment from the "New Girl" star. Wayans Jr. told the website that he and Metoyer, who have two daughters together, have pretty much nothing to do with each other except for co-parenting. "My concern are my daughters and that they don’t get hurt in any of this," he told the website, adding that the girls "love their little brother." It seems unlikely — and fortunate — that the girls will get caught up in any scandal: Wade has already owned up to being the father of Metoyer’s baby boy, in a news conference this week, and Union is reportedly OK with what happened. Xavier was conceived during a "break" in their relationship, Wade said at the conference. "I, my lady and my family have continued to move forward, and I think that’s evident with the ring and the proposal that I gave her," Wade said Monday. He called the child a "blessing" and said he was moving on. The Miami Heat star is already raising two sons, Zaire and Zion Wade, from his marriage to Siohvaughn Funches, from whom he split in 2007, in addition to a nephew, Dahveon Morris. Union, who has had a series of positive messages on her Twitter page all week, wrote Monday, "The goal is NOT perfection… The goal is to be whole." She and Wade spent New Year’s Eve together in the Bahamas.